At 5 years old, I didn't know a whole lot of women. Outside of my mom, the ones in my life were on a different level. They required a "Miss" or "Mrs" title. Parents and teachers made up the majority of these women - adults who expected me to behave. It was through the Teenage Mutant Ninja Turtles, I was exposed to a different type of woman - a breed that didn't require the "Miss" or "Mrs" title. Nope, these fine ladies only went by their first names - a real shocker in the kid community. These women were strong. These women were silly. These women hung out with guys like me. These women were April & Irma. 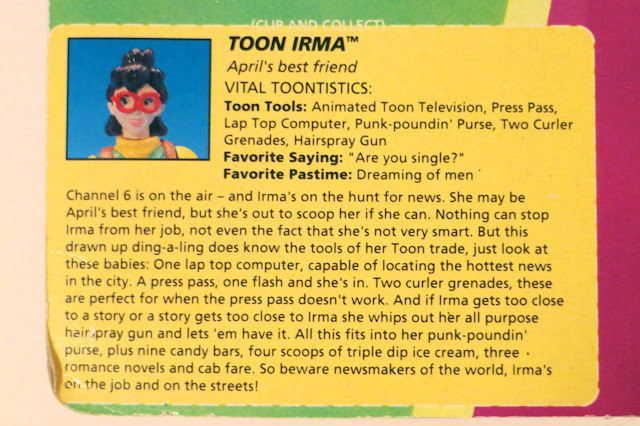 April & Irma were my introduction to women. Sure, they were cartoons. But, they were sometimes more real and human than those scary adults that I had encountered at 5 years old. April & Irma told jokes that legitimately made me laugh. Although April was the one who owned the spotlight, it was Irma who captured my attention. She was no pillar of feminism, but brought her own blend of womanhood to the table. Her buggy glasses, frumpy wardrobe & dry, yet razor-sharp humor catapulted her into elite sewer status. Irma didn't take life too seriously - poking fun of herself & most of the men she encountered. She pulled no punches when it came to comedy. Her insight on day-to-day life and dating was also a window into a world I would one day experience. I know it's a goofy concept - getting life direction from an 80s cartoon character, but at the time, it was all I had. Irma was, and still is, awesome. 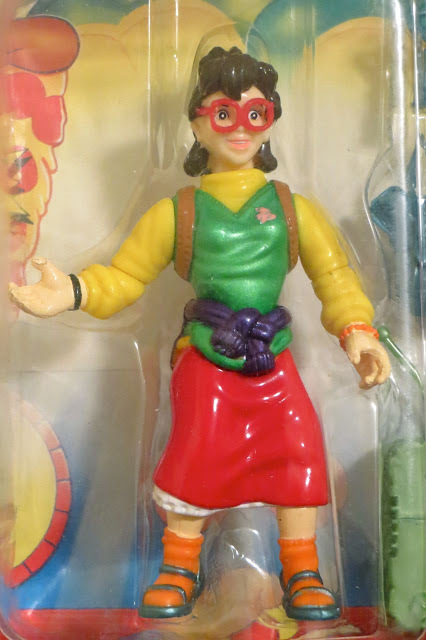 That's why her absence in my TMNT collection was so disheartening. How could such an important thread in my TMNT fabric go uncollected? I really wanted her action figure - as a kid & as an adult. With each passing decade, the Turtle Power passion grew, pushing her onto my 10 Holy Grails list. She belonged in The Sewer Den. Jump ahead to October of 2015. My birthday month. Irma's heyday from the classic cartoon series is long gone, but she is not forgotten. My parents ventured up to my place in New York City to celebrate my birthday weekend with me. We did the usual fun stuff - explore the city, eat, drink & be merry. After singing "Happy Birthday," they gave a few presents to the birthday "boy" of 32 years. They handed me a gift with a familiar shape that mustered up a forgotten nostalgia. I fought the urge to behave like a complete animal. Slowly, I tore away at the wrapping paper. 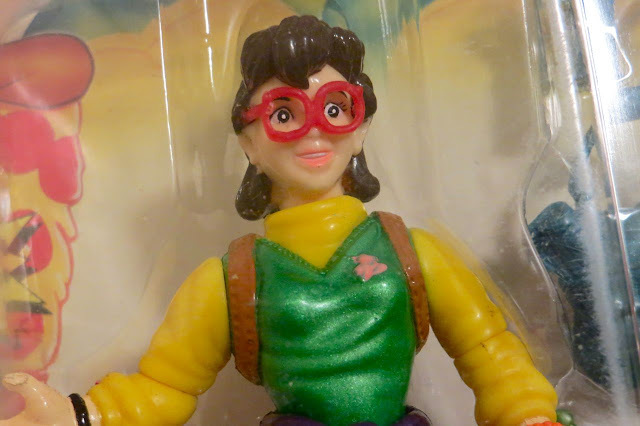 Bit by bit, an original Irma figure from 1992 emerged. Call Channel 6 News! This was a major event - a groundbreaking scoop. The iconic Irma figure I wanted for ages was finally in my hands! My relationship with women has evolved over the years. Irma isn't the only gal to provide female insight these days. As cool as she was, I've now befriended many other women who have shown greater importance - as friends, colleagues & mentors. But that doesn't mean Irma has lost her sewer spotlight. She's part of TMNT history, of my history. And after decades, she's finally a piece in my collection. Oh, and her action figure...I bet that's probably what you want to read about here (instead of a sappy boy's view of women). The anticipation did not disappoint. Irma's figure is a plastic treasure. There's a weird wardrobe, silly accessories & fun packaging that captures her endearing spirit. The only odd element is the color scheme of her wardrobe. It's radically different from her cartoon counterpart. Every piece is an alternative color. Strange stuff. Thanks to my Dad & Mom for bringing Irma to The Sewer Den! IRMA! 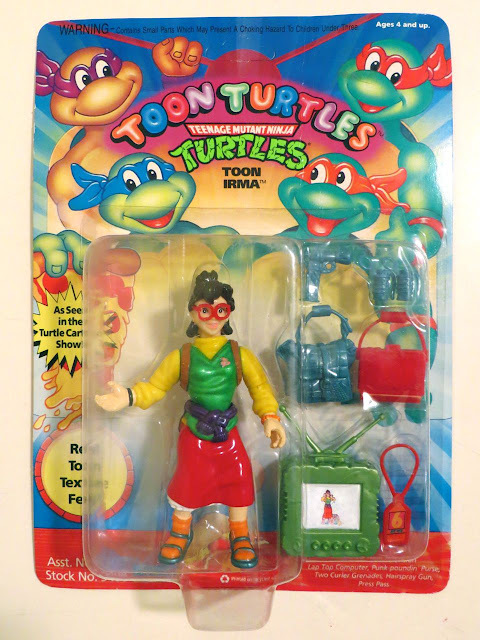 What an amazing figure (I love the kooky outfit... if there was some blue in there I'd guess she was sporting all the turtles' colors!) 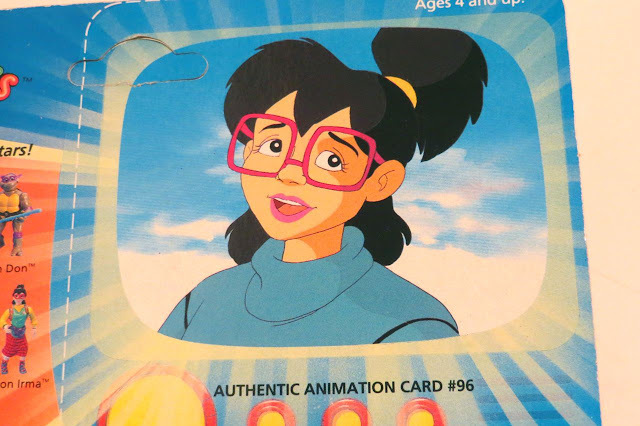 Your memories and experience with Irma as a character growing up are completely awesome. 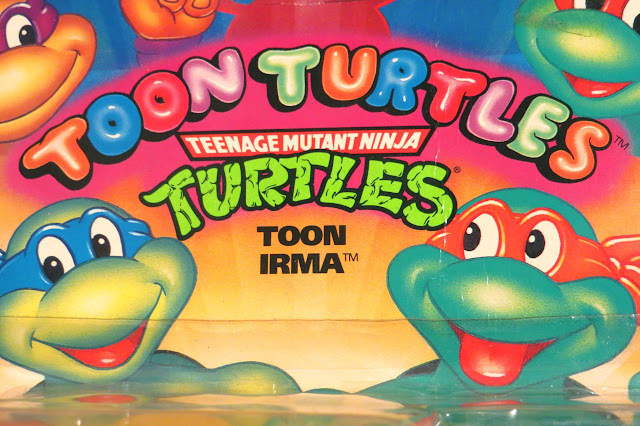 As a female TMNT fan, and now an adult, looking back at Irma I have a whole new appreciation for her character. She was completely confident in herself while also being that 'ditzy clumsy' character, and completely witty and funny to boot. I love that she was man (and turtle) crazy -- it was done in a way that was both comedic and giving her some agency (that as kids we didn't understand or worry about). Also, the back of the box is hilarious... curler grenades? Priceless. Enjoy your new treasure! Thank you! I'm glad you also appreciate Irma's awesomeness AND noticed those zany accessories. They're so bonkers! If I ever have an action figure in my likeness, I hope the included weapons are equally as wacky. Open open open! Happy belated birthday - and you are not alone, my parents just gave me Batman and Robin action figures tonight for my 41st birthday!